We heard them before we saw them. A great roar and rumble which stopped pedestrians in their tracks in Shoreditch High Street in London on Saturday. 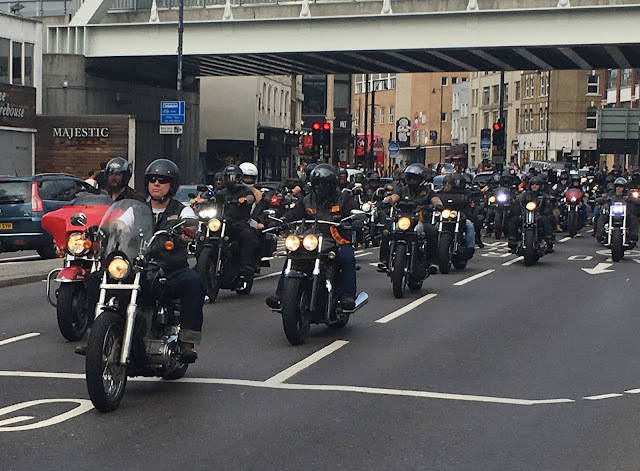 A great tribe of bikers wearing the badges of their club. Or Charter? We think they were Hells Angels but couldn't read the badges closely enough to confirm. Whatever, I thought it was a majestic sight (can you spot the the sign agreeing with me?) although the black cab driver who got embroiled in a short stand off with them probably would disagree! Ha! I love this shot! I am not clued up on bike groups but cool capture though! A serious rally in progress there.